Las Vegas food tours are becoming a thing on The Strip and downtown. Sin City is not only about glitz, glamour and casinos. 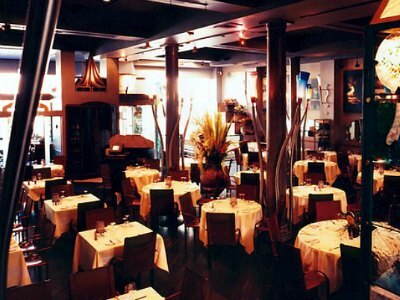 Hidden away on the Strip and Downtown are delightful authentic world class eateries. Discover them with a knowledgeable guide on unique walking and scooter tours. Combine learning about the history and culture of the city with sampling tempting dishes as you go along. Get behind the scenes to meet the chefs and restaurant owners for exclusive VIP treatment. Don't leave Vegas without trying a few of these fabulous food tours! 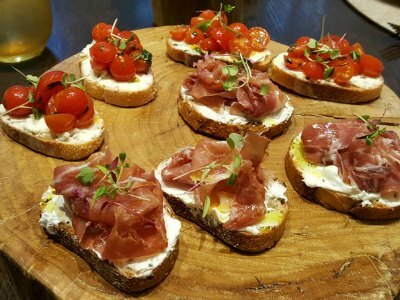 When you want to combine a little adrenaline with some great tasting food then a must do Las Vegas food tour for you is the Maverick Foodie Tour Las Vegas. This 4.5-hour foodie excursion will have you walking, eating and flying above the Strip for an incredible bird’s eye view. The tour begins when you meet your expert tour guide at the Aria Hotel where you will view the Focus Fountain at Aria. From here you will start your walk to satisfy your taste buds while you listen to interesting stories about Sin City from your guide. The restaurants you will sample change regularly and you might stop at Sage, Milos or Bardot. There will be time along the way to have a few beverages as you are sampling some of the best cuisine in the city. Just when you are about to burst from the delightful cuisine you will head over to the Maverick Helipad and board a customized sightseeing helicopter. Once you are in the air you will soar above Sin City for 15-minutes while your eyes indulge in the neon signs and bright lights. Your food filled flying excursion comes to an end when you land. 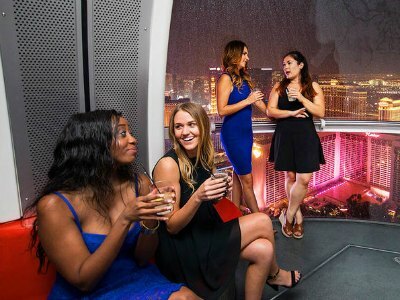 Start your first Las Vegas food tour high in the sky on the High Roller, the worldÕs largest observation wheel. Climb into a luxury, air-conditioned pod with your group of friends, only over 21's allowed, and be wowed by the panoramic views and witty commentary from the narrator. You have access to a full bar for the 30 minute ride. The wheel is located in the fabulous LINQ entertainment center. Get the party started in the sky and when you touch down, head off to the Hash House A Go Go for traditional American comfort food, or experience the Mexican taste at the Chayo Mexican Kitchen & Tequila Bar. 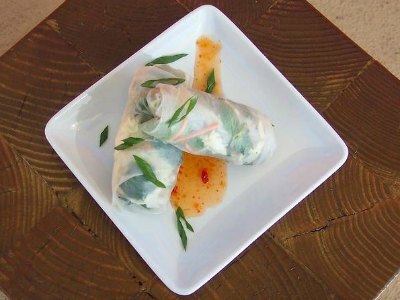 Skip breakfast if you intend doing this Las Vegas food tour! This fabulous two and a half hour walking tour with a knowledgeable guide will take you to hidden gems. You will stroll along the Strip, see the sights and stop to sample twelve delicious dishes in four different restaurants. Learn interesting facts about the venues and the passion that drives the Chefs. Enjoy VIP service and a variety of cuisines as you are treated like royalty. 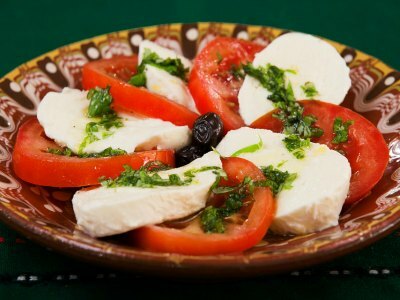 Try Spanish tapas and contemporary Mexican. Discover a French Brasserie and delight in fusion Japanese and Asian fare. Then gorge on the ultimate mega American Steakhouse treats that will leave you gasping. Your guide will leave you with a list of more fabulous eating venues, for another day! Food lovers cannot miss this next Las Vegas food tour, it will delight your taste buds as you eat at renowned impossible-to-get-into venues, unless booked months in advance. Walk around with your guide in the fabulous Downtown section and experience its unique and distinct urban character. Stop at the acclaimed Carson Kitchen, founded by the celebrity Rock n Roll Chef, Kerry Simon. Enjoy the open kitchen and taste fresh seasonal ingredients used in the signature dishes. Then set off to Glutton, located in a mid-century, industrial-chic building. Sip a craft cocktail with a plate of scrumptious snacks. A taste of Japanese is next at Bitsy. Walk it all off as your guide updates you on the history and culture of Las Vegas Downtown. Get introduced to some of the best gourmet restaurants on the next Las Vegas food tour. 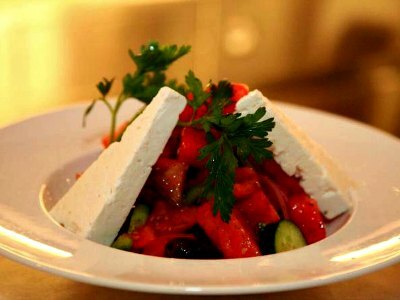 This evening adventure is a three hour delight where you will walk along the Strip with a food loving guide and stop at five eateries and enjoy fifteen different dishes ranging from starters to mains and desserts. World class chefs will tempt you with a variety of flavors. As you venture from venue to venue, your guide will keep you entertained with fascinating stories on the restaurants, their history and the chefs. The restaurants and menus change regularly, so you can take this tour many times and never get bored. At the end of the tour, you will have a list of more eateries and info on where to stop off for a late night cocktail and star-quality entertainment. Head downtown for a delightful eating experience on this Las Vegas food tour. It combines history, culture and cuisine to show that Sin City is not all about casinos! 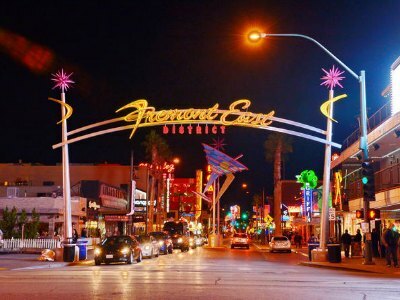 The walking tour with a guide takes you down Fremont Street, where you will be updated with fascinating anecdotes about the area. Stop at off-the-beaten-track restaurants and enjoy delicious food while you chat to the owners and chefs. This tour is limited to twelve people and offers an intimate and relaxed experience. Venues change but you may visit the fabulous Beef Jerky Store, the ChillSpot, a frozen dessert shop and Simply Pure, a speciality vegan and raw food cafe. This eye-opening tour shows you another side of Vegas and cannot be missed. 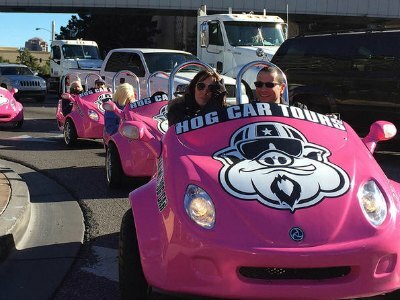 For the ultimate fun experience, ride a Hog Car scooter around Las Vegas to see the sights and enjoy fabulous eats on this unique Las Vegas food tour. The four hour trip takes you to the famous Las Vegas sign, the Chocolate Fountain, the Venetian and the Palazzo as well as the iconic TV studios where world class shows are filmed. For the food, you will stop at famous eateries along the way, many of which have been featured on TV, and be welcomed by the owners and chefs to sample their signature dishes. End your day at the Rio Hotel where you will love the VIP treatment as you are taken up to the viewing balcony to admire the panoramic views of Sin City. The Food Tour of the Las Vegas Strip is one of the best ways to experience Sin City and learn about the culture as well as the food of the area. On this 2.5-hour Las Vegas food tour you will first meet your guide at the Cosmopolitan Hotel where you will start your excursion of dining and sightseeing. Some of the best hole-in-the-wall restaurants on the Strip serve some of the most tantalizing treats your taste buds will experience. During your 1.5-mile walk you will see some great sites such as live flamingos, the world’s largest chocolate fountains and you will probably run into an Elvis. While you are walking working off the calories you can even indulge in a beverage or two at your own expense. The tour highlights various restaurants that can change daily so be prepared to try all of the great bites that Las Vegas has to offer. Your foodie good time will conclude back at your starting point. 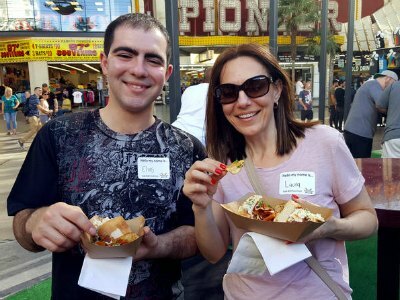 If you are the type of foodie that like to mix history with a tasty cuisine then an ideal Las Vegas food tour for you is the Downtown Delights Food Tour. Your 2.5-hour dining journey begins when you meet your expert guide at the Downtown Container Park. From here you will set out on foot while listening to interesting stories told by your guide. You will get a chance to taste some of the best dishes that eateries in the downtown area have to offer and you can purchase a few drinks along the way. While you are walking you will see such highlights such as the 12.5-million LED lights of the Fremont Street Experience, the world’s largest golden nugget, $1,000,000 cash and even a piece of the Berlin. The restaurants that you visit change regularly but you can be assured of a pleasant time for your taste buds while you learn more about the history of Glitter Gulch. Your walking tour concludes at the Golden Spike on Las Vegas Boulevard. 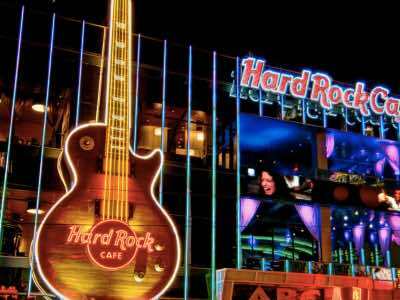 One of the best Las Vegas food tours for people that want to mix musical history with some tasty food is to take the Hard Rock Cafe Las Vegas Tour. This is a very flexible excursion that is perfect for families and foodies. Once at the world famous Hard Rock Cafe you will indulge in a two or three-course meal that is designed to keep everyone happy. Diners can enjoy hickory smoked ribs, salmon, steak, a classic cheeseburger as well as options for non-meat eaters and you can finish your dining pleasure with a fashionable dessert. The decor will keep you interested with numerous artifacts of musical legends on display for you to see. Items range from a pink dress of Amy Winehouse to the T Rex Guitar to a Bob Dylan jacket to an expense log of the Grateful Dead. Other interesting artifacts include a letter from the Beetles and a dragon shirt worn by Jimi Hendrix as well as a unique toaster given to Elton John on Valentine’s Day. 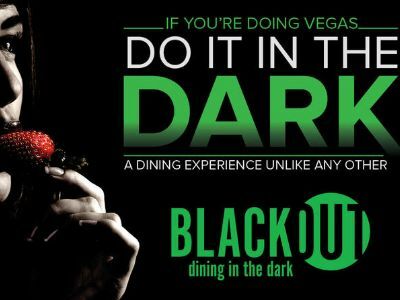 A very unique and pleasurable Las Vegas food tour for all types of foodies is the Blackout Dining in the Dark in Las Vegas Tour. This 1-hour dining extravaganza will have your taste buds and your senses wondering what delicious items you will be eating next. While you sit in total darkness you will be served a menu of sweet, savory or spicy dishes that are coordinated to complete a pleasurable dining experience. Your taste buds will be delighted with each bite as you indulge in a 4-course lunch or a 6-course dinner. Your imagination will run wild along with all of your senses as you devour one course after another in complete darkness. There are no cellphones or other lighted objects to help you and you must rely on the texture, smell as well as taste during this feast. When you are finished dining you will be given your cellphone and escorted to the exit.